Sourced and shipped over from the USA in December 2014 by a renowned marque specialist this Matching Numbers ’66 Mustang Fastback has been subject to a nut and bolt restoration with an exceptional eye for detail. Completely stripped and where necessary remedial repairs made. There is no evidence of any welding to the frame, patches of any description and all panel gaps are correct. All rubbers have been replaced and all exterior chrome, bumpers, lens etc are ‘as new’, with the restoration house even going to the detail of replacing manufacturers vinyl decals, including the ‘original’ in-transit stickers. 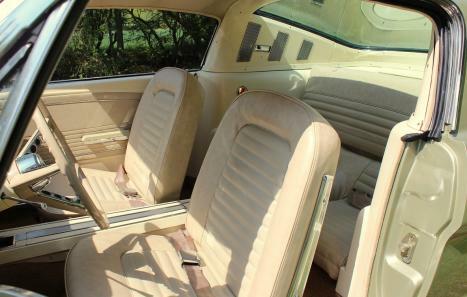 The car was then painted in her original Sauterne Gold Metallic and looks amazing and is fitted with a optional Driver & Passenger Side Mirrors. The underside of the car is equally spectacular, I would describe it as ‘new’, with all new nut/bolts, gleaming powder coating / painting of components…you could eat your dinner from the underside, I can supply extra images! The stunning original specification Parchment and Ivory Gold interior looks spectacular and the attention to detail is evident when looking at any of the photographs. The dash / steering wheel are free from any cracks as are all the interior mouldings, including her optional Full Length Centre Console. She is fitted with seatbelts front and rear and al interior chrome handles, winders etc look like new, the original specification ‘loop’ pile carpet has been replaced and the only change from original specification is the fitment of a modern ‘RetroSound’ Hermosa AM/FM radio (operating via a retractable electric aerial) with Bluetooth / MP3 connectivity which will even enable hands-free phone calls! The trunk / boot again is finished like new with her correct for ‘65/66 Plaid Trunk Mat. 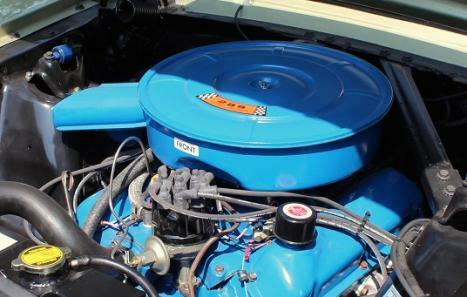 Being a Matching Numbers, this C Code car features the optional V8 289 engine and also comes with the rare and sought after 4 speed ‘Toploader’ transmission. All mechanical components have been either been rebuilt or replaced. The V8 289 Motor looks ‘crate’ fresh and has been subject to a complete rebuild. The gearbox / clutch is smooth to operate and the rear axle is super quiet. Still very much ‘like new’ the car has done very few miles, but she starts easily with the intoxicating V8 rumble coming from her twin exhausts. Open the throttle and the body rocks showing that there’s plenty of torque to come from the V8 motor, but with the car having complete so few miles since the rebuild I would say she is still being ‘run-in’. It is evident that all new suspension bushes, shock-absorbers have been fitted along with a complete new exhaust system to ‘original’ specification. The optional 14” Steel Styled wheels are ‘as new’, completely blemish free and fitted with a matched set of new tires. 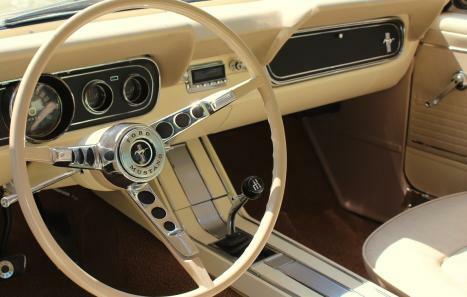 The only change from original specification is that the Mustang has now been upgraded to disc brakes at the front and also received an upgraded Aluminium radiator, for improved cooling. 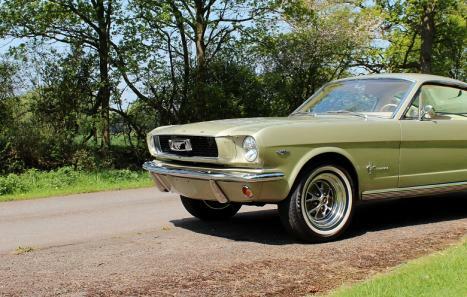 Helping a friend to sell and coming with an original 1966 MUSTANG owners manual, some previous US documentation, valid MOT (March 2017) and Customs Clearance documentation this iconic American Muscle Car must be one of the best available to the UK / European market and always attracts admiring glances; a truly exceptional example.